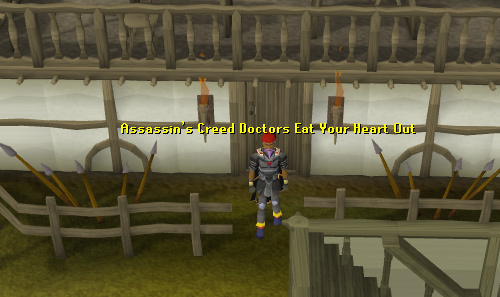 West Ardougne, pronounced West Arr-doug-knee, is a plague infected city that is featured in many important quests. 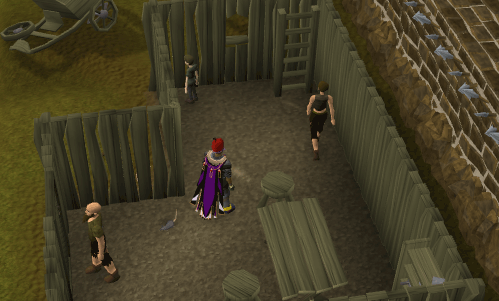 The city is fenced away from East Ardougne with a great big wall. Mourners, who are in fact the Death Guard, wander the streets of West Ardougne giving "support" to those who need it. This dilapidated city has many attractions, including a Mourner's HQ, the entrance to the Underground Pass, a graveyard of zombies, an altar and a teleport lever which when pulled leads to deep wilderness! West Ardougne is obviously west of East Ardougne. 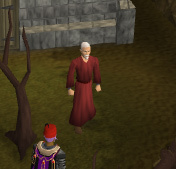 West Ardougne is north of the Khazard Battle field, southeast of the Tree Gnome Stronghold and southwest of the Fishing Guild. This method requires a Magic level of 51. Teleporting to East Ardougne requires 2 law and water runes and the Plague City quest to be completed. 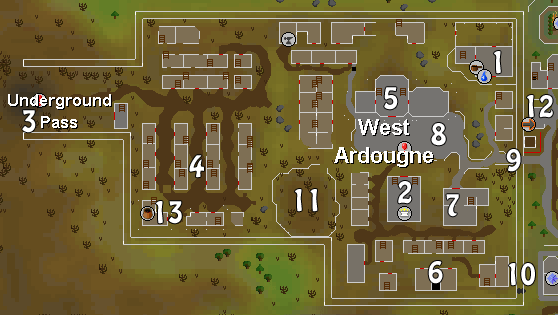 Unfortunately, there is no teleport to West Ardougne, so once you've teleported you will need to walk west from the market to get to West Ardougne. Taking the tree spirit requires the completion of the Tree Gnome Village quest. You could choose to go to the Khazard Battlefield. 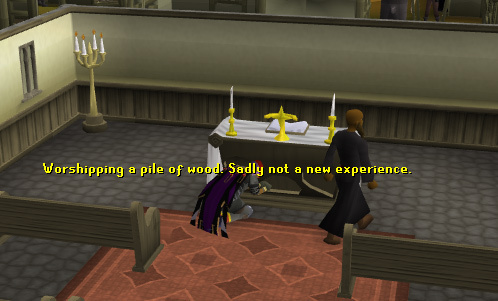 When you arrive there, you'll be a few steps south of the West Ardougne. Walk north to get to the city. West Ardougne is famous because of all the attractions that can be found. All of them will be explained in detail here. Attraction number one on the map brings us to the Mourner's HQ. This secret building is where the Mourners, AKA the Death Guard, reside. The building is used in the Plague City, Mourning's Ends Part 1 and Part 2. You can enter via the main door entrance, or by slip by the fence at the back. To enter via the main entrance door you need a set of Mourner's clothes; a gas mask, a shirt, some trousers, gloves and boots. These can be obtained by killing the Mourner at the Arandar Pass. If you do not have any of that equipment, then slip by the fence at the back. In the main building you will find a sink and a range. Around the building will be several Mourners, the experienced Death Guard can be identified by a black filter on the gas mask and the new ones with a white filter on the mask. If you talk to them they will tell you all sorts of shocking things about the Death Guard. In the garden there is a cauldron and some Mourners. If you go down the ladder you will be in a basement, which contains several level high-leveled Elf Mourners. They will attack you if you are not wearing your full Mourner equipment, so beware! 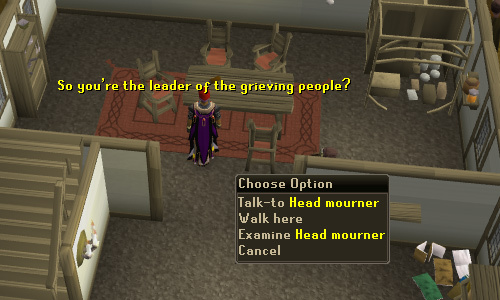 In the south building you can find the Head Mourner, who is featured in the quests Mourning's End Part 1 and 2. There is a door on the west wall of the basement which leads to the Dark Beasts and the Temple of Light. You can get the key for the door from the Head Mourner if you are doing Mourning's End Part 2. Near the centre of the city is a church. Inside the church there is an altar that you can pray at to recharge your prayer points. Walking around the church is a Priest who doesn't really say much. Upstairs you can find some beds and a table. At the west side of the city you can find the cave entrance to the evil god Iban's home, the Underground Pass which leads to the Elven lands of Isafdar. Surprisingly, it is used in the Underground Pass quest. Koftik can be found here, who also is also featured in the quest. A short walk east of the entrance to the Underground Pass is the Dark Mage's tower. 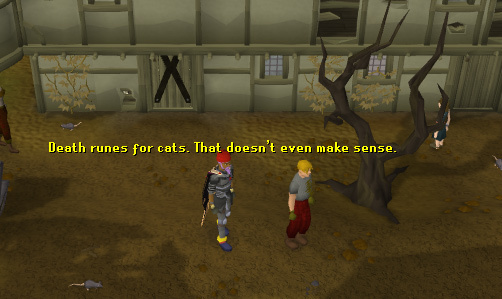 The Dark Mage can repair your Iban Staff for 300,000gp, and he will also trade your Kitten, Cat, Overgrown Cat, Lazy Cat, or Wily Cat for 100 Death Runes. When in West Ardougne you will notice a lot of rats on the floor, and it's annoying the civilians. 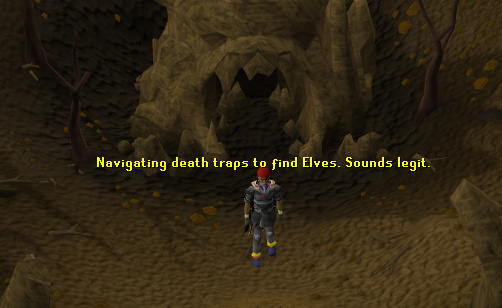 By talking to one of them here, you can trade your cat in for 100 death runes. It has to be a cat, not a kitten or overgrown cat, as cats are more agile for catching rats. 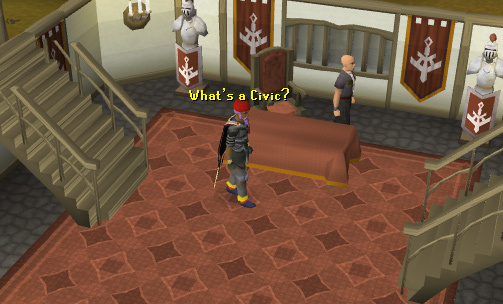 This is the Civic Office of West Ardougne. Here, you can find the clerk. In the east room is Bravek, who has a hangover that you need to cure in the Plague City quest. In the western room are some grain sacks which you must poison during the Mourning's End Part 1 quest. This house is identified as a plague house by the black cross on the door. The house is a main feature in the Plague City quest as this is where Elena is found. The Head Mourner can be found in here. He is featured in the Plague City quest. In his house a knife and chisel can be found on the table, and both can be taken. Scattered around the building are some empty chests. A manhole can be found at number 8. 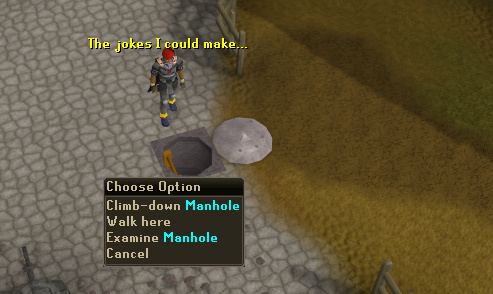 You can get into West Ardougne via this manhole which leads through the sewer. You need to use the manhole in the Plague City quest, although once you have completed the quest, you cannot use it again. 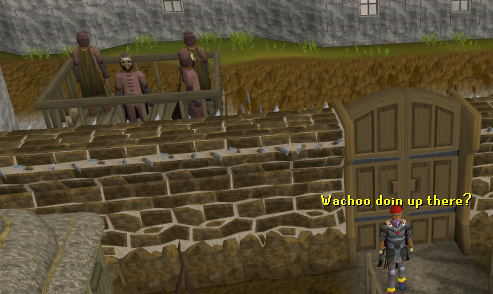 These gates are the main way to get into West Ardougne. You can go through them without a gas mask upon completion of the Biohazard quest. 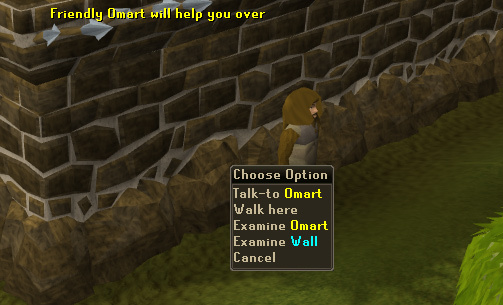 At attraction number 10 you will see a man named Omart walking around. He is featured in the Biohazard quest. In the quest he helps you build a ladder into the city and distract the Mourners. Zombies and ghosts roam around this highly populated graveyard, which is not surprising given the ill welfare of citizens. It could possibly be a good range or magic training area because of all the "safespots". 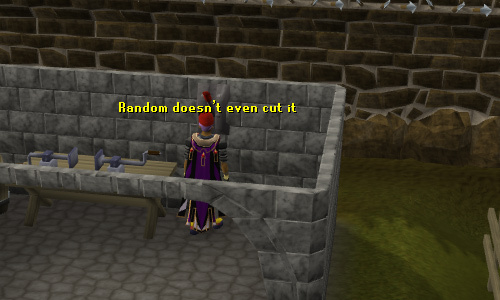 This is a special lever built just outside the city gates, but it belongs to West Ardougne nonetheless. To access the lever, enter the small workshop with an arrow sign on it. On one of the walls is a lever. If you pull it you will be teleported to level 50 wilderness. The lever is very useful for accessing things like the Mage Arena or Rune Rocks fast, but beware of Revenant Ghosts. You need a knife or a slashing weapon to get out of Deserted Keep due to spider web, if another player hasn't slashed it recently. There is only one shop in West Ardougne, the General Store. It can be found in the southwest corner of the city. The store sells all sorts of items that an adventurer would need. Food is in short supply, so be expected to pay rather a lot for it!